Pancit or pansit (noodles) is a constant dish among Filipinos. It has been introduced into the country by the Chinese and has since been adopted into the local cuisine. In fact, no birthday is complete without it. According to food lore (also handed down by the Chinese), pancit should be eaten present in every birthday as it represents long life and good health. In lieu of its popularity, there are now varieties of pancit available in the market including sotanghon, bihon, canton, miki, among others. There are also various ways of preparing pancit that are unique in a given province such as the pancit habhab of Lucban, Quezon; batil patong of Tuguegarao; pancit bato of Bicol region, among others. 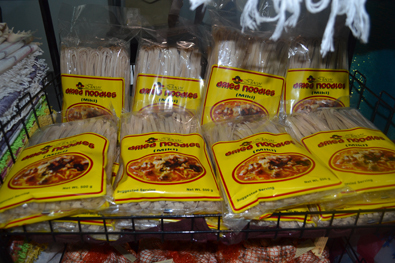 Another innovation that has been recently developed is the garlic-enriched dried miki noodles of the Ilocos region. Pancit miki is an all-time favorite merienda enjoyed by the Ilocanos. A visit in Ilocos will not be completed without tasting their famous local delicacies, pancit miki. Ilocanos’ pancit miki is often flavored with garlic. This is the reason why researchers from the Department of Agriculture – Ilocos Integrated Agricultural Research Station (DA-ILIARC), developed a noodle product that is already incorporated with garlic powder. Garlic is an in demand ingredient in cooking as it provides flavor and aroma to the dish. It is also known for its medicinal properties which can treat a wide array of diseases. According to the U.S. National Library of Medicine, among its health benefits are: it is rich in antioxidants, it helps in weight management, it treats fungal infections of the skin, it can reduce blood pressure, and it can lessen the risk of acquiring atherosclerosis (hardening of the arteries) and some types of cancers. Ilocos is the major garlic-producing region in the country accounting to about 60-70 percent of the total’s country garlic production. Ilocos garlic is preferred variety as it is known for its distinct pungent and aromatic smell. To support the garlic industry in Ilocos and to ensure that there will be ample supply of Ilocos garlic available in the market, the Bureau of Agricultural Research (BAR), under its National Technology Commercialization Program (NTCP), funded a project “Garlic Technology Commercialization in Region 1”. This initiative aims to help Ilocos garlic farmers to adopt new technologies on garlic farming and to boost their production and income. To capture larger markets and to empower the garlic stakeholders, through creating agribusiness on garlic, the project also include as one of its components, garlic processing and other value-adding activities one of which is the product development of garlic-enriched miki. Other products include: garlic polvoron, garlic pickles, garlic powder, garlic flakes, and garlic chips. The preparation of garlic-enriched miki is just like any other preparations of a regular miki. Among its ingredients are all-purpose flour, garlic powder, and water which will make up the dough. The dough is flatten and cut using a pasta cutter, and left to dry. The process is simple and can be done even at homes. The DA-ILIARC partnered with the Association of Garlic Growers and Processors of Ilocos Norte, the beneficiary of the project wherein the technology on garlic processing was transferred. The Association makes used of the facilities of DA-ILIARC for garlic processing. The garlic miki is being marketed at the local markets in Ilocos while the Association supplies the garlic miki to some food restaurants in Laoag City. To further promote the garlic miki and other garlic products, DA-ILIARC is joining various agricultural trade fairs and exhibitions including the BAR National Agriculture and Fisheries Technology Forum and Product Exhibitions held every August at SM Megamall. Is there garlic miki in Manila where I can buy?